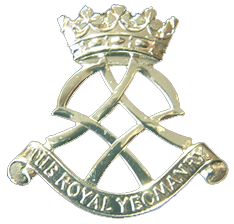 The Royal Yeomanry is a Light Cavalry Army Reserve Regiment equipped with RWMIK (Land Rover Re-life Weapons Mounted Installation Kit). The unit is roled to provide a strategically deployable light reconnaissance capability which is employable across a wide range of operations from Peace Support Operations through to stabilisation interventions, to enabling roles in major combat operations. The squadron is based at Sharpshooter House, Mitcham Road Barracks, Croydon.